This autumn, Ha Giang’s government will organize the first circuit triangle flower to attract people who love amazing landscape of limestone and granite outcrops and the endless pink flowery fields. Tourist can wear traditional clothes of local people to have best picture. 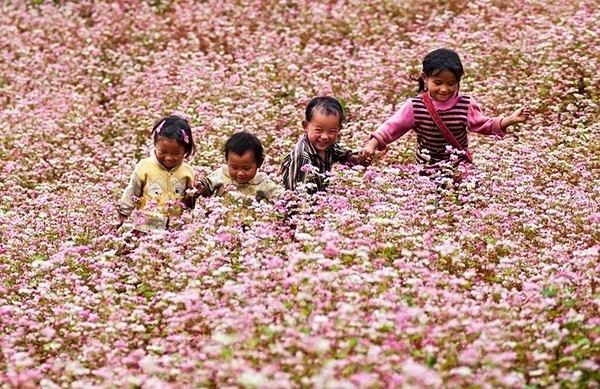 The festival aims to promote, introduce signature image, traditional culture of local people living in the region people to Dong Van Plateau – Worldwide geography parks with numerous tourists and domestic and international friends. Purple circuit triangular flower garden glowing in hillsides, foothills. 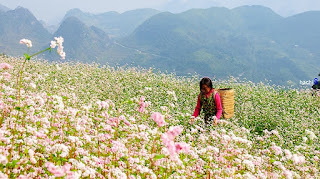 Flower triangle circuit is characterized by the northern mountainous province by its simple wild beauty. In the autumn days of October, when the golden sunbeam entangles all the way, it is time for the circuit triangular flower blooming pink on the field, stretching to the horizon. 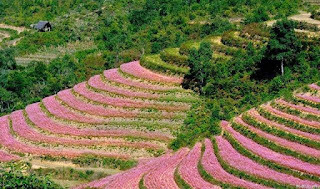 It is so coincidentally, just one day after local people crop the rice terraced fields, the yellow will be replace by endless pink flower fields triangular circuit. When just opening flower will have while, after changing to pink and when faded flower is ruby red. 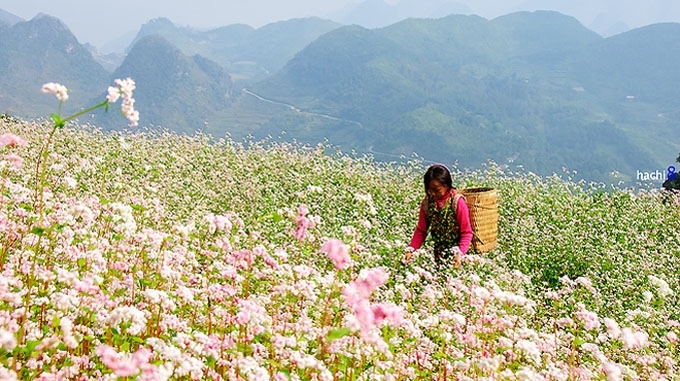 It creates poetic beauty to Ha Giang district in autumn. It is special if you have a chance to join with local people to get flour of kernel triangular circuit. They can make some delicious cakes or mix this flour with corn kernel to brew wine creating a special flavor. 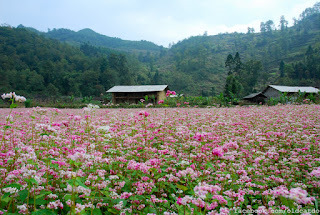 In order to have a nice trip to Ha Giang on right time of flowers blooming, tourist can make a plan for 2 weekend days in October or November, and check the weather to have a safe tour. 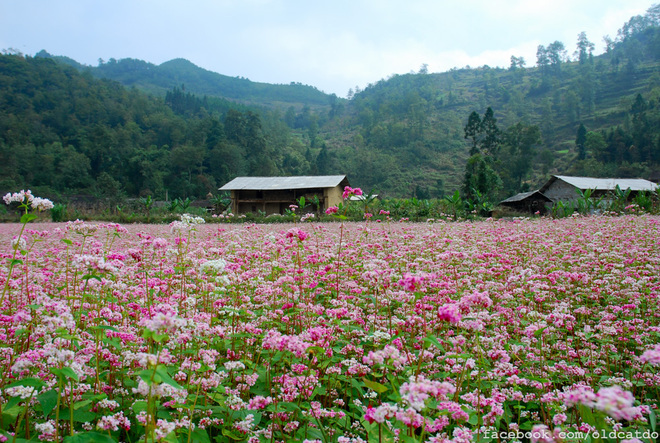 Sung La seems to be the most beautiful triangle flower field in Ha Giang. The purple pink petals touch the soul of a lot visitor. In Sung La, you can visit the famous house was filmed in the move “House of Pao”. Moreover, you can come to the local market to see the colorful of Mong or Lo Lo ethnic people. Pho Bang is an old village with more than hundred year old. There are many houses with the typical lunisolar Chinese roof. It is also known by the rose garden was planted outside the valley. When the triangular circuit fields have started flowering, the young people come here to take photos, and discover the pristine mystery beauty of this place. 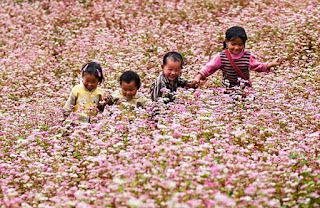 In addition to exploring the colorful circuit triangular season landscape, you also have opportunities to explore the lives of indigenous people each region you pass.Flower festival circuit triangle will attach to the series of cultural activities such as the 3rd praise of Mong festivals; amateur photo exhibition themed composer, promote Dong Van Plateau; Plateau tourism fairs. There is nowhere that you can one see more fusing traditions than this province because in there has a major of Hmong, Tày, Yao and Nùng ethnic groups.